Performing regular maintenance on your vinyl records can sometimes cost a lot. In fact, you’d have to spend quite a lot of cash for lathering your records in most cases, but we’re here to offer you some budget-friendly alternatives. Without any further ado, let’s get straight to it. A microfiber cloth is easily the most affordable vinyl record cleaning tool. The cheapest ones usually cost only around $5 while more durable ones are still within the same price range, costing several bucks more. The microfiber cloth pieces are non-abrasive in most cases, but you should be careful not to purchase a rugged one, else you’ll end up scratching up your records. 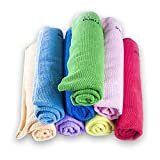 Among the most notable benefits of using a cleaning cloth we can number the sheer cheapness of it and the practicality it brings to the table. Cleaning cloth pieces are very easy to use (meaning that you’ll have a hard time messing anything up), and you’ll get the job done for the least amount of cash in turn. 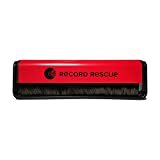 While cleaning cloth pieces are great for cleaning vinyl records, a cleaning brush specialized for records is better in many ways. For instance, cleaning brushes can “dig in” deep into the groves, cleaning out even the smallest particles of grime or dust, whereas a cloth piece will only clean up the surface. Another reason why we recommend using a cleaning brush is because cloth pads drain the electricity – by simply rubbing the pad against the record, the friction will eventually start attracting the dust particles. Of course, better microfiber cloth pads won’t present such a problem. The only bad thing about vinyl record cleaning brushes is that they cost a bit more than cloth pads. Even so, they’re not “expensive” per se, and you’ll be able to get a quality brush for approximately $15-$20 bucks. Alternatively, there are models that cost $30 and more which offer more durability and reliability. A cleaning mat can be combined with both microfiber cloth or cleaning brush. Basically, the mat should be placed under the record so you could focus on detailed cleaning of your vinyl records. Good cleaning mats usually cost about $15, and they offer an easy way to clean the records away from the turntable. The benefits of using a cleaning mat mainly revolve around better cleaning. Using a cleaning cloth will wipe away the grime from the surface, the cleaning brush will clear away even the smallest particles of dust, and all of this will be easier if it’s done atop a cleaning mat as opposed to atop the turntable itself. The vinyl cleaning arm is a modern contraption which is one of the few automatized record cleaning tools. In essence, the cleaning arm features an affixed cleaning brush on it which will clean the records even while they’re still spinning. A basic cleaning arm costs approximately $25 – $30, but using it might eliminate the need of using other cleaning tools. The main benefit of a vinyl cleaning arm is convenience – the records will be cleaned “on the go”, and you won’t have to do a single thing apart of buying one. On the other hand, the cleaning brush on the arm will remove the dust even before it gets to the stylus, so it’s safe to conclude that this is one of the most efficient, as well as one of the most convenient ways to clean your vinyl records on a budget. Here’s another “modern” vinyl record cleaning tool. The cleaning gun removes the static electricity stationed around the corners of your records. This electricity draws and attracts dust particles and grime and pulls them deep into the grooves. The main benefits of cleaning guns are that they’re very easy to use, they never need to be replenished, and there are simply no better means of eliminating the electricity from your records. On the downside, a record cleaning gun usually costs about $70, but on the plus side, they’ll stick around for years and you can use them indefinitely. In most cases, specialized record cleaning tools cost quite a lot. However, there are exceptions that fall into the budget price point category. Such is the case with, for example, Disco’s Antistat cleaner which costs approximately $50 or Vinyl Styl Deep Groove Record washer system. In essence, cleaning records is a plain process, but the tools might or might not be the problem if you’re on a budget. We’ve presented you with several easy ways of cleaning your records for the least amount of cash possible, so all you have to do is take your pick or even combine them if you wish. Prices last updated on 2019-03-19 Source: Amazon -Turntable.guide is a participant in the Amazon Services LLC Associates Program, an affiliate advertising program designed to provide a means for sites to earn advertising fees by advertising and linking to Amazon.com. My name is Robert Halvari - audio engineer and a total audiophile. I love vinyl because it has that natural character which brings music to life. I've been using and testing vinyl record players for around 12 years and dedicated this blog to help you choose the right player and enjoy the world of vinyl. I am a frequent visitor to estate sales and tend to find vinyl records in people’s basements. Pretty much all of them are in need of a good clean but I really never knew how to do so on a budget. I’m not one for spending much on restoration. I don’t know why I hadn’t thought of a velvet cleaning brush before! Great idea. Thanks for sharing. Just don’t have enough time to clean my records one by one. Have hundreds of them. Those Spin-Clean products looks promising. Spin-clean products are pretty good. Especially the MKII. It’s not the cheapest option but saves a lot of time. I’ve found it’s quite hard to clean old records and I’ve had a bunch of them sitting around forever. Never knew how to clean them. However, I think I’m going to purchase the cleaning gun and see if I can’t make the records look like new again. This is exactly what I was looking for! I am in the middle of helping my parents move into a new house and my father has a collection of vinyls, some of which are quite dirty. My brother and I are working on setting up a nice office space for him in the finish basement for him for his 60th birthday. We have to clean a lot of them and I didn’t want to pay to have it done on top of everything else. Thanks for the info!